Watching the warm weather slip away into fall is made better by one thing – pumpkin bread. Pumpkins are best known for their use as a Halloween decoration or sweetened in a pie, but did you know their bright orange color is due to their high beta-carotene content? Beta-carotene is a powerful antioxidant that plays an important role in maintaining our eye and skin health, something everyone can appreciate! (1, 2). Pumpkins and their seeds are also a good source of omega-3 fatty acids which play a role in fighting off inflammation (3). Full of flavor and incredibly moist, this Whole Grain Pumpkin Bread is fabulous any time of day. 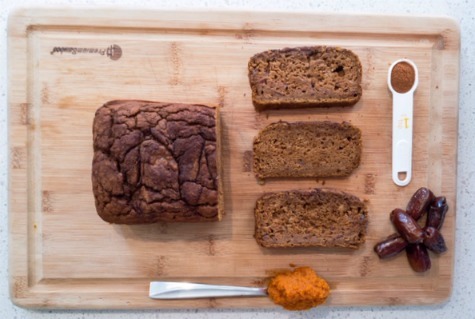 Traditional pumpkin bread can be packed with added sugar. 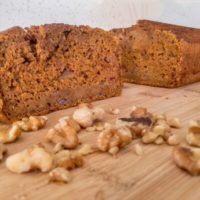 Switching out the white flour for whole wheat and using dates for sweetness, this pumpkin bread is the “healthy” version of a fall classic you don’t have to be sad about. This bread has a mild sweetness that can be cranked up with 1-2 more tablespoons of maple syrup. In a microwave-safe bowl, heat 8-10 dates with 1 tablespoon of water for 30 seconds. Carefully remove the bowl and mash with a fork until paste begins to form. Add additional water as needed and microwave for another 30 seconds. Repeat as necessary until ½ cup date puree is formed. In a large bowl, mix together the eggs, date puree, oil and Greek yogurt. Add the milk, pumpkin puree, pumpkin spice, vanilla, baking soda and salt, and use whisk to blend. Stir in 1-2 tablespoons of pure maple syrup. Mix in the whole wheat flour, just until combined. Pour bread batter into greased 9×5 loaf pan and cook for 55-60 minutes. Notes: Feel free to spice up your bread with more pumpkin spice than the recipe calls for. Adding spice is a great way to turn up the flavor while not adding additional sugar. Add in your favorite nut or dried fruit for extra fun! Bio: Kelly is a dietetic intern from Orange County, CA. She studied nutritional science as an undergrad at CSULA and would like to eventually specialize in GI disorders. She enjoys taking her dog to the beach and trying new cuisines.